eBay was founded in 1995 and is one of the most popular shopping destinations on the web today. Their auctions have managed to keep bargain seekers glued to their computers for years and their daily deals are really no different. In fact, many will say that eBay's daily deals are better because you don't have to worry about bidding. instead, you just buy the items via the 'buy it now' option. So say hello to savings and goodbye to the bidding wars! Of course you still have to make sure that you grab the deals before they are gone, but hey, who said getting a good deal was easy? 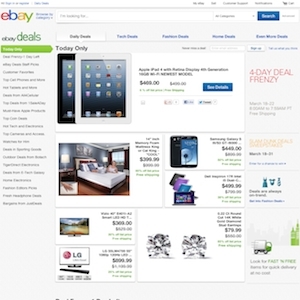 Ebay.com currently ranks #2 amongst sites offering online deals -- Amazon ranks #1. In the General Merchandise category, Ebay ranks, once again at #2 -- Amazon.com again ranks slightly higher and the same as before, at #1.